The results of survey recently undertaken do not make good reading if you are British. Latest figures indicate that UK women are the fattest in Europe with their male counterparts only fairing slightly better. The results of the survey are not a total shock, the biggest shock was that the UK has won something. 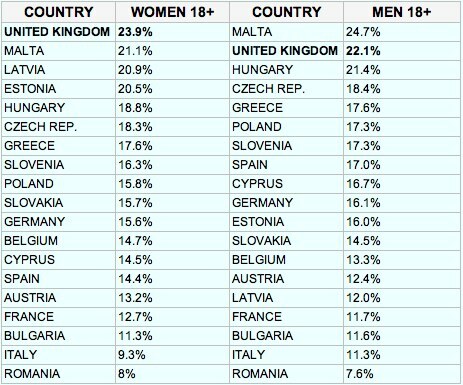 A quite surprising statistic though was that both Maltese women and men ran the UK close with Maltese women coming second and Malta’s men being the most obese in Europe. Anther interesting statistic was that former Soviet states Lativa and Estonia were at the higher end of the obesity league matching Britain’s penchant for overindulgence. At the other end the fat table Romania and Italy were the countries least affected by Obesity. Denmark, Ireland, Lithuania, Luxembourg, Netherlands, Finland and Sweden did not partake in the survey.